the waves reaching our shore. steering by obituaries of light. 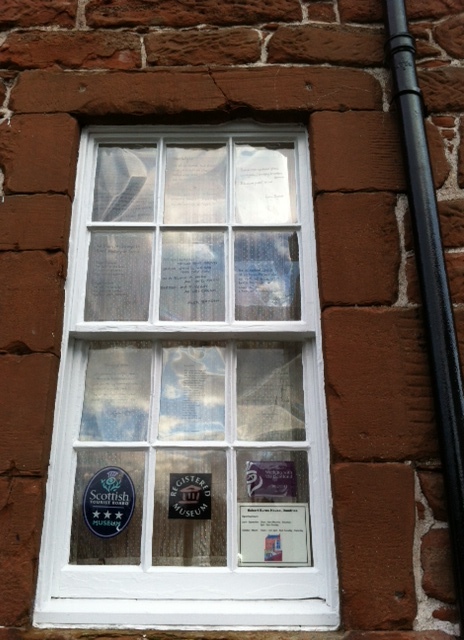 Hugh Bryden, of Roncadora Press, has organised this event for the past couple of years: poems displayed in windows around Dumfries to celebrate the Bard. Thanks to Mark Russell who took this photo of poems in the window of the Robert Burns House Museum (including this one of mine). Mark has a poem up at the Globe Inn; the Coach and Horses is the other venue. All are on display until February 17th. Roncadora press has produced a lovely pamphlet with a selection of poems from last years event, each one handwritten by the poet.